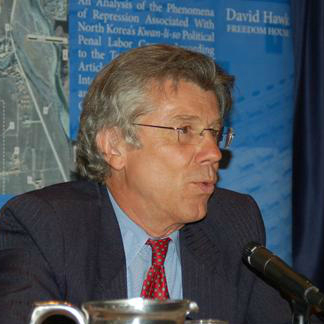 David Hawk is a former Executive Director of Amnesty International, USA, and a former UN human rights official in charge of the Cambodia Office of the UN High Commissioner for Human Rights. He has written numerous reports on human rights issues, most notably on the genocides in Cambodia and Rwanda, and political prison camps in North Korea. He regularly participated in North Korea-related developments at the UN Human Rights Council and General Assembly. Hawk has been a visiting scholar at the Columbia University Institute for the Study of Human Rights, and taught at Hunter College, CUNY. Currently he resides in Sarasota Florida and teaches in the International Relations Department at the University of South Florida (Tampa).